I should have said...Property taxes! maybe it makes more sense now. 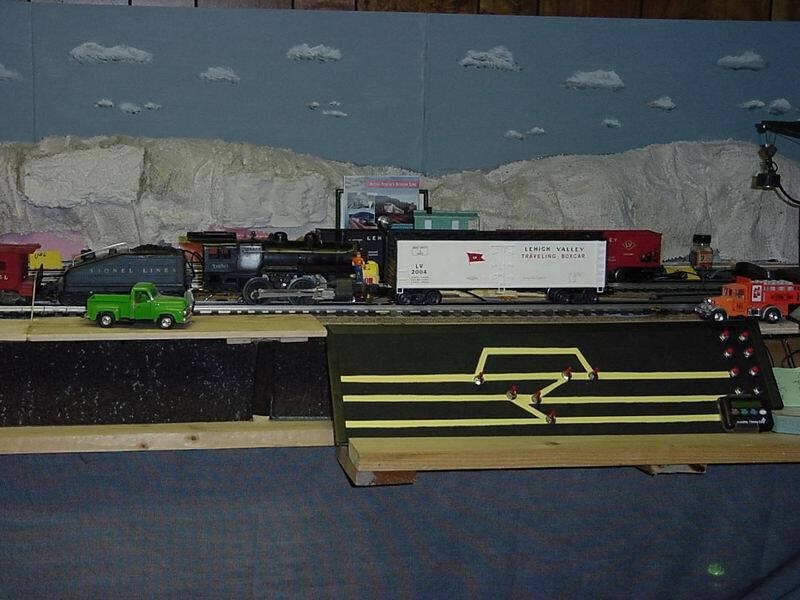 The seller threw in 2 pieces of Lionel T-Rail track, seen in the photo below, under the track the loco is resting on. These are the first 2 pieces I've ever had. I think they are pretty nice looking. If these are the only 2 pieces I have, at least they are in good shape with no signs of Zinc Pest/Rot. There was a story in the other mag about a guy...Nick Balasimo (sp) that had a T Rail layout, and another guy had a Prewar layout using the T Rail. It looks great, but is expensive and not a lot out there. I'd love to have some, but it's above my pay grade. I have some news on all things #228 related. I had picked up two prewar #228's off of eBay, one just before Christmas. We'll call that one #228 number three (since it was my third #228). The other around New Years (yes, #228 number four). The first one was not running when it arrived, but I was able to get it running after soldering on a disconnected wire. However, I noticed the wiring was pretty brittle. I guess my wiring would be a little brittle if I was almost going on 80! So, again, I got it running and the e-unit worked flawlessly, but it was running on too many volts. Luckily, Harry Henning answered my email and said, "Tom, send that bad boy in." This was my second (in a row) prewar switcher where I needed help. Harry's brother Tom worked on it and after I got it back, after being rewired and repaired, it ran like smoothly like it just left Joshua's factory. Three of my four #228's are seen here, the repaired #228 is in the middle after coming back from Harry Henning's shop. On the left is my usual workbench #228 switcher, on the right is the new arrival, received in January 2019. This one luckily broke up my string of needing to ship my switchers off for repairs, which I hate to do. This locomotive ran well from the start, but was a bit noisy. A little Red 'N' Tacky on the gears and Labelle oil on the armature shaft and she is also another smooth runner, just like the day she left the factory. Boy I wonder if they just retooled my restored 1656 from the same old molds it sure doesn't have a lot of changes. I just put it back on my layout last week to show some friends how good it runs. I really like the look of this old gal especially with the slant back tender. Good luck with your restoration. It worked for many years as my "go-to" switching engine until my love affair/addiction/affliction with the 227-series locos began. well here is a Postwar 1615 repowered with a Prewar switcher motor....fit like a glove. It looks like they all came out of the same mold?????? I believe so, the postwar 1615 and 1656 and the prewar 1662 and 1663 all had shorter boilers. I recently picked up a frame from a prewar 227. 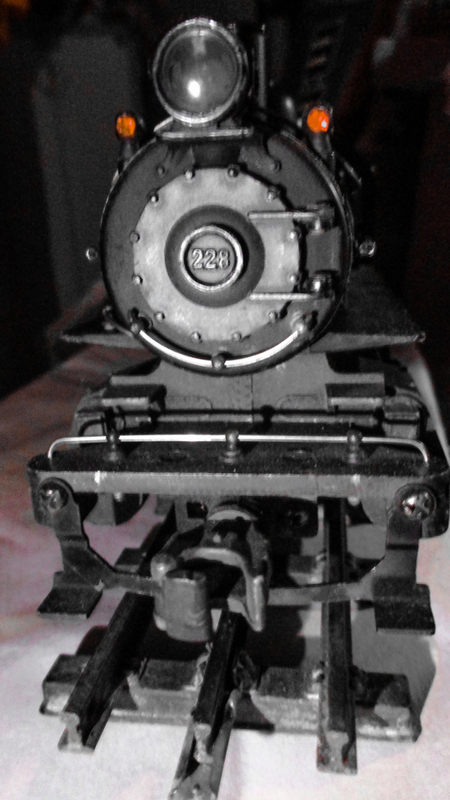 After cleaning off a lot of old grease I discovered that this locomotive had a custom made worm and worm wheel. These were very nicely made. The worm had a single lead and the worm wheel, the gear on the axle had 20 teeth. The stock worm is a three lead worm and the worm wheel has 21 teeth. The srock 227 has a gear ratio of about 14.77 to 1. This means that the motor turns 14.77 times to make the wheels turn once. With the custom made single lead worm and gear, the gear ratio was about 42.2 to 1. This switcher was a really slow running locomotive. 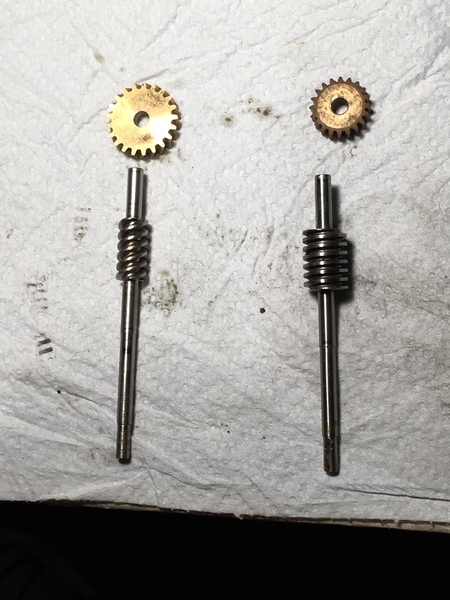 In the photo below the gear on the left is the stock worm and gear and the worm and gear on the right is the custom made, single lead worm. I have a 1615 and recently picked up a nice 8516 which is a more recent model than I usually buy but it is nice. The other day I was running them double headed which was cool. Have to look for a prewar 227 series. That's very interesting. Somebody must have really loved these switchers to go to that trouble and have decent machinist skills to turn something out that looks very professional. So, you found it in a frame of a locomotive...are you willing to take the next step and install it in a working 227-series locomotive? So, those internal gears would not mean that the external gearing and idler gears would need to also be re-machined differently, correct? I know Harry Henning was originally on this topic...I wonder if he would have any interest in casting copies of that if it works. Wow David, how lucky can you get!! I've asked this before... 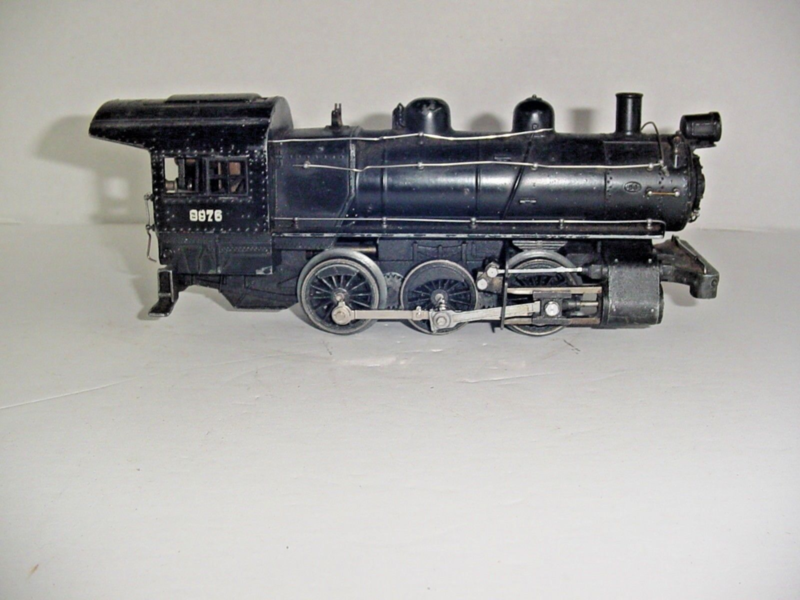 In the '39 catalog, Lionel claims their scale switcher has a "20-to-1 gear reduction." When discussion on the Forum revealed an observed ratio of 14.77, I wondered whether Lionel changed the gearing during early production. I know for a fact they changed the ratio of the 700E (in that case they made it slower.) Are you sure this is a custom job? If Lionel originally used tower gears of 1:1, your worm and worm wheel would yield the gear ratio of 20:1 claimed in the catalog. From the apparent pitch of the worm, I presume this unique combo of worm and worm wheel are self-locking. Can you turn the worm shaft by turning the geared wheels? 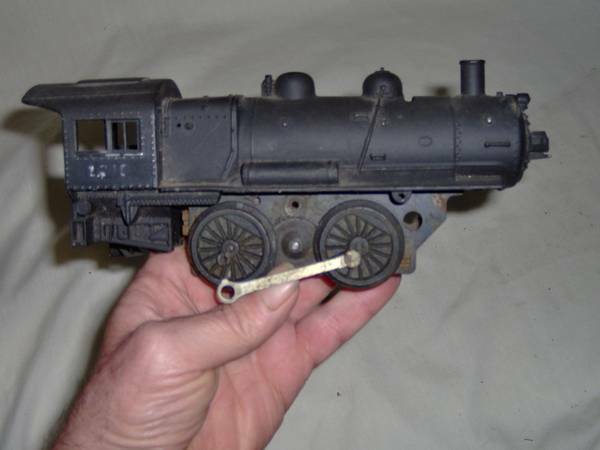 Along with possibly being perceived as too slow, if the loco didn't coast freely, that might be another reason why Lionel switched to a taller gear ratio with a multi-threaded worm. @Steamer @gene maag is that 1615 shell in your photo repowered with a 227-type mechanism, or a 201 / 203 type mechanism? I always thought the 227 "semi-scale" switchers had a longer boiler. The 201 / 203 0-6-0 is a neat engine that was never reissued after the war. I have no doubt that the 203 6-wheel parallel plate chassis would be a drop-in upgrade for a 1615. 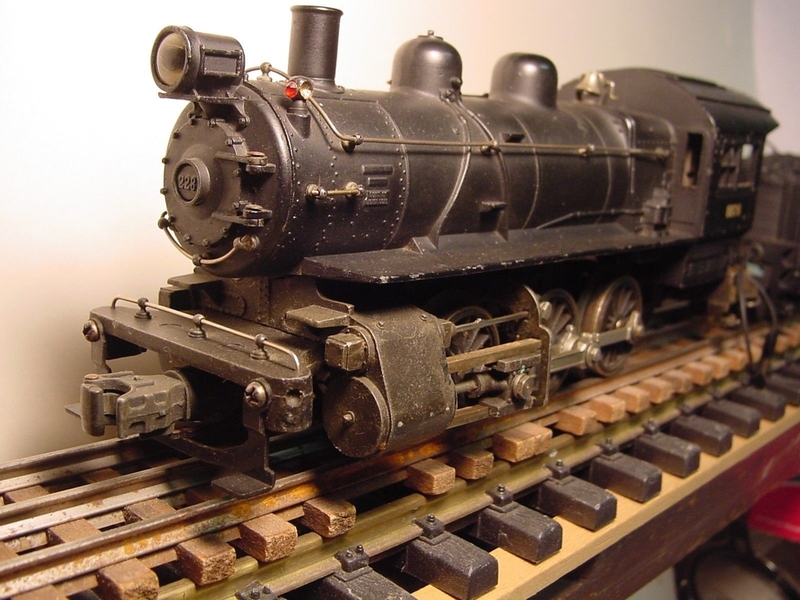 I've also seen some home-made upgrades using a 1666 or 2026 chassis. Not sure how difficult this mod is, but I've seen it more than once! That you would have to ask Dennis Holler, I got the motor from him, but I do believe you are right that the scale switchers are longer. Dave's boiler is the shorter version used by the 1656, 1615, 201, 203, 1662 and & the 1663. How about a long boiler list edited in? How about a long boiler list edit in? Not sure if you are asking for a list of the long boilers? 227,228, 230, 231, 232, 233, 701 (scale) and the 1989 remake. Yep It's kinda nice when the info is close. Ted, as far as I know, Lionel never used worms on locos with less than three leads because of the lock up issue you pointed out on single and double lead worms. There was not enough of this loco for me to be able to date it. So I have no way to know how old it was. It would be a lot easier to adjust the ratio by changing the design of the two spur gears rather than redesigning the worm gear. On the 700E there were actually three unique drive train designs. Took me a while to figure this out. The first 700Es had a 1/8" thick flex coupling element. This must have proved to be inadequate as they changed to a 1/4" thick flex coupling element. To accommodate the thicker coupling element they shortened the worm gear shaft. As you pointed out the, third design was a change to the worm and worm wheel design to change the gear ratio. This third design also has the shorter worm shaft. Tom, to install this in a loco would require tearing the center wheel and axle assembly apart. This is actually something I try to avoid. It is a lot of work and risk to get everything put back together correctly. But I will think about. If I came up with a good frame, I might try building a frame up from the ground up. One of the beauties of this design change is it does not impact anything else. Just the worm and worm wheel were changed. Everything else is original 227.